Construction of the new Macallan distillery in Craigellachie, Scotland; May 2018. The latest in whisky maker The Macallan’s Master Decanter Series — a range of rare Macallan expressions housed in specially produced Lalique decanters — is The Macallan M Black, which was launched locally with fanfare at the opening of The Macallan’s pop-up store at Elements. The pop-up, whose doors remain open until April 11, takes centre stage in the Metal Zone of Elements mall. Its striking construction, inspired by the architecture of The Macallan’s new Graham Stirk-designed Speyside distillery, is crowned by an elegant lattice roof that borrows from the distillery’s undulating timber roof structure. A further nod to the distillery is evident in the glass archival wall lining the back of the pop-up, which displays a range of Macallan expressions ancient and modern. To one side is a VR station where visitors can take a virtual tour of the stunning distillery. And on the other side stands — of course — a bar for sampling this remarkable single malt. Construction of the new Macallan distillery. The Macallan Decanter Series is characterised by complex whiskies matured in sherry-seasoned oak casks and displaying natural colour. 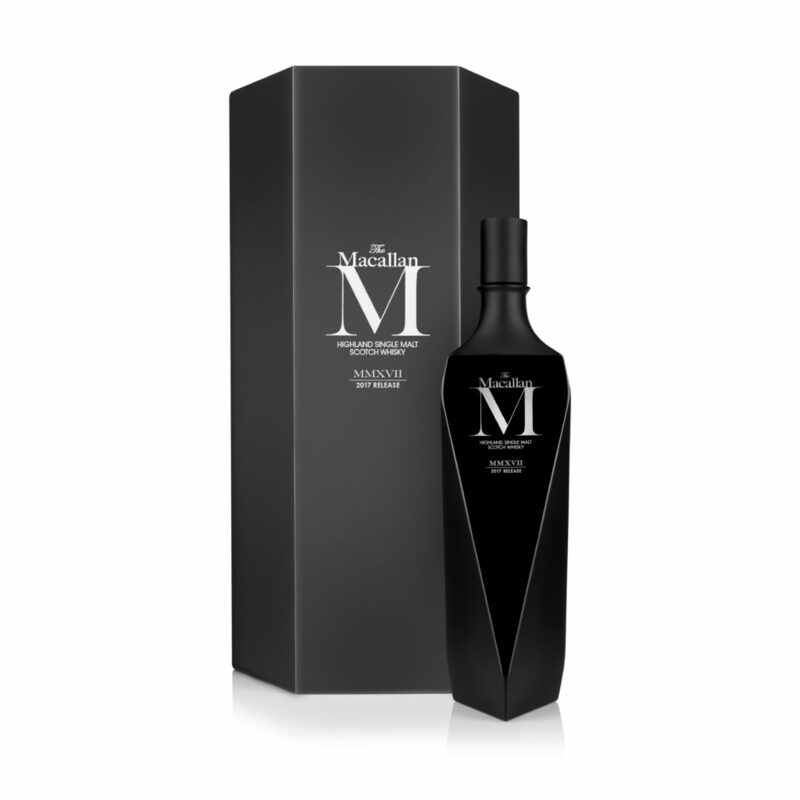 The M Black comes in a black crystal decanter designed by Fabien Baron, the French art director and magazine editor whose publishing tenures include Italian Vogue, Harper’s Bazaar, Vogue Paris and, most recently, Andy Warhol’s Interview magazine. French glassmaker Lalique carried out extensive research and prototyping to produce a distinctive and lustrous crystal decanter, sharply angular in appearance, and jet black in colour to reflect the unusual provenance of its contents. As a result of World War II, The Macallan was unable to obtain its normal supply of coal for the malting process, so for a short time the distillery turned to peat. This is the basis of the smoky nature of M Black. In fact, so rare is the whisky produced during that period that M Black is limited to only 725 black crystal decanters globally. Connoisseurs will discern in this aged burnt umber distillate a cherry chocolate sweetness, dried fruit and fresh citrus notes in the nose, travelling to salted caramel and a subtle smokiness. The palate is no less complex, delivering espresso, dark fruit and chocolate moving into wood spice, peat and a long, smoky finish.